17) The 78 RPM phonograph records became the standard in 1926. 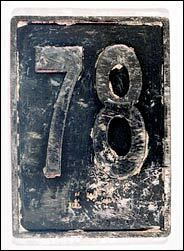 The common name for such records as 78s or "seventy-eights"
as they played at 78 revolutions per minute. 18) In the song The Twelve Days of Christmas, 78 gifts were given on the 12th day. (22 Major Arcana cards + 56 Minor Arcana cards = 78) Tarot history goes back to the early 1400 in Northern Italy. The 52-deck playing cards were first mentioned in Spain in 1371. Special cards were added that could beat any card of the four ordinary suits called trionfi (triumphs), from which our word trumps is derived. When the game spread from Italy, the word Tarocco became Tarot in French and Tarok in German. By the late 1400, the 78 card pack with 21 trumps, 14 cards per suit and a Fool had become fairly standard. Until the 18th century, the four suits were: "spade" (swords), "bastoni" (batons), "coppe" (cups), "denari" (coins). 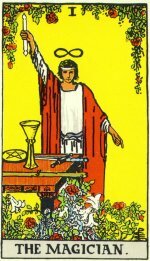 In the late 18th century, the coins and batons were transformed into pentacles and wands, and the term "major arcana" was introduced for the 22 trumps. brings awareness of myth and modern psychology to the Tarot's ancient symbolism. The author provides a thorough description of each card encompassing art, history, literature, mythology, and psychology. we and our wealthy nobles have awakened. Show yourselves fruitful, Dawns, as ye are rising. Preserve us evermore, ye Gods, with blessings. upright words sound upside down. associate with the good, associate with the best of men. in the course of moderation. becoming fearful, humbles himself does it cease. Effecting plans lies in discerning the moment. By being humble and retiring, one can be free of anxiety. last movement would accompany her in her journey to the next world. gives his definition of free speech (no right to shout "fire" in a theater) in 1919.